Dannus Erekwane is summoned to help look into a frightening occurrence: forty thousand people have vanished from a Jennithusian coastal city. All that remains there are a few thousand elders—all of them dead, all wearing expressions of sheer terror. A cryptic clue points across the waves toward the distant, forbidden land known as the Feroonian Continent, long shunned by the Jennithusians. Reluctantly, Dannus and his mates set sail across the deadly Black Straits to an unknown fate. 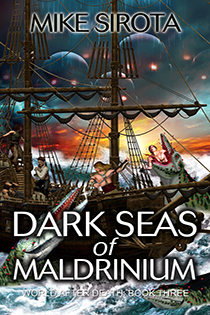 What horrors will they encounter upon the Dark Seas of Maldrinium?